Here's a good BEFORE picture: BORING! -Cut strips of plywood at 5 7/8'' width. You can use a full sheet of plywood with almost no scrap with that measurement. Home Depot or Lowes can cut your plywood for you too. Sometimes they charge a small fee, but it's worth it if you don't have the tools or room to cut it yourself. -Lay out the first row slightly above the baseboard. -Use Liquid Nails to adhere the paneling to the wall. -Use the level to make sure it's straight. -Nail in place using brads and a nail gun if you have it. -Lay out the next row using a nickel as a spacer. You'll want to stagger the ends so the seams don't line up. Once the boards are adhered and sanded, then you can prime the boards. Steve's got his nice painting clothes on for you. I chose hooks from IKEA that we installed right onto the boards. We topped the last row with a piece of decorative trim. We used bullnose trim, but you can use any type of trim or nothing at all. I definitely see us doing more ship lap walls in our home. I think ship lap looks classic and nautical, which is my favorite look. The half wall with the boards, nails, paint and trim piece above cost about $100. 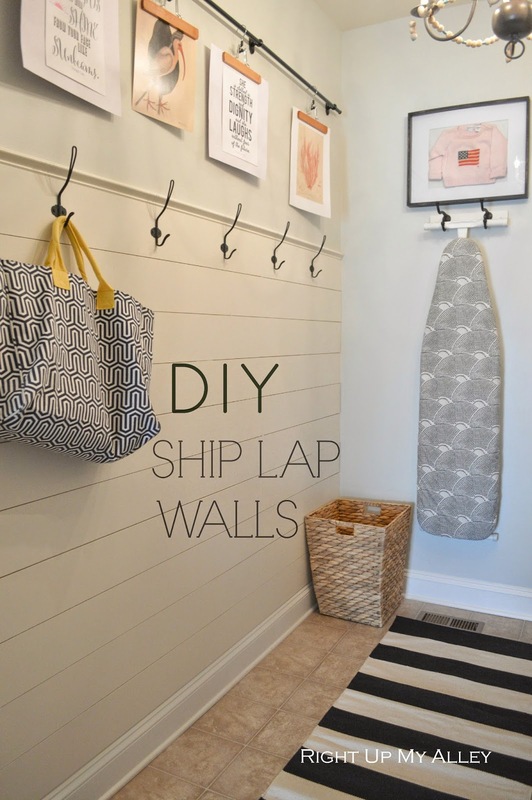 Have you done ship lap walls before? Those pesky budgets do help one become more creative for sure. I like how ours goes 1/2 way up too, so I could hang some art above. looks fabulous! i love the halfway up, too, and the solution for the artwork above. Thanks Cassie! I like the wall half way up too so I could hang me up some inspirational things to look at while I fold. Hi Tracy! 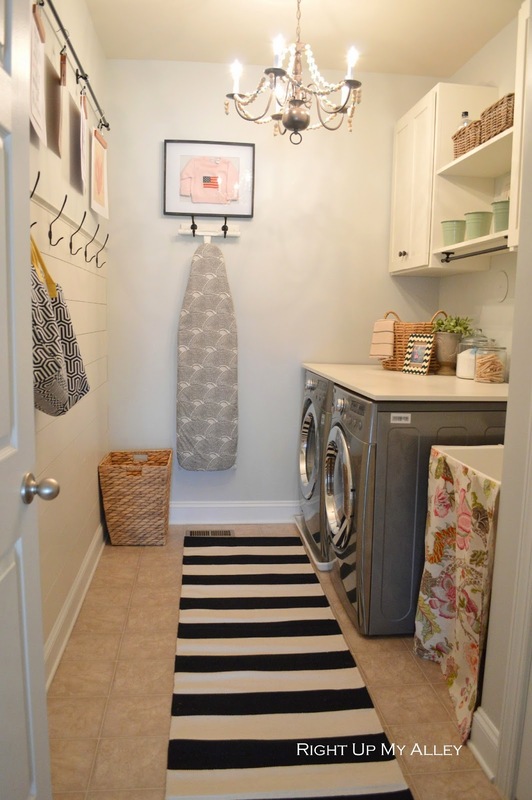 Love your awesome laundry room! You have inspired me to do a wall of ship lap in the kids bathroom! Ill be calling you! Miss you! Thanks for the tutorial! We're about to do our guest bathroom with shiplap. I'm trying to determine what finish to use on the boards. Typically in our bathrooms we use the Aura Bath in matte finish but I'm so used to using satin finish for our trim. What finish did you use on your shiplap? How high on the wall did you go? I love that height! what was your wall dimensions? Did you stagger the seams(different length boards)? I have a 17ft wall and want to board it but all the shiplap I've seen don't have vertical seams. Hi... with a 17' wall you will have to stagger your seams, rather you use boards or plywood cut into strips. If you don't want the vertical seams to show, you will have to fill with wood filler (sand smooth once dry) then paint. Hi! Great project! Well done! I was wondering if you have had trouble with the plywood warping, especially being in a room with a dryer? Thanks! Hi was wondering what color you did on the walls? Thanks. Because a rustic home is such the trend nowadays, many people have been looking for a look that is not difficult to do, but can change the look of a home in a very strong and significant way. 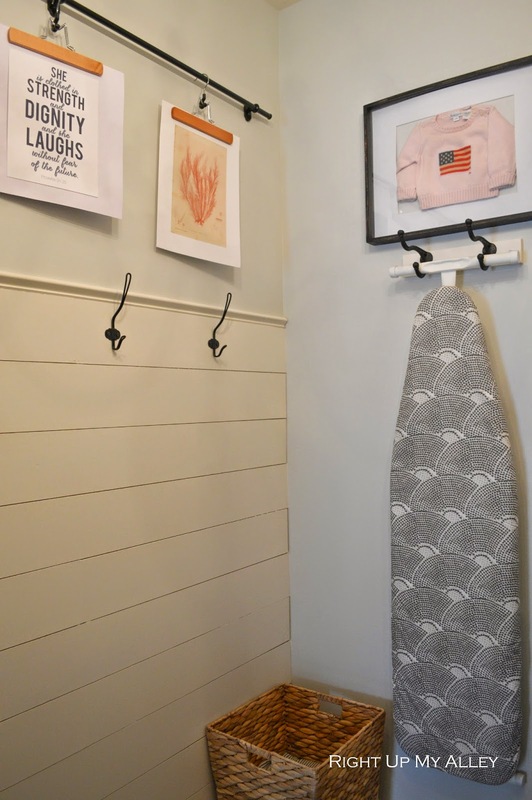 Having at least a way converted into a shiplap wall, can do exactly this for a home. The clean look of horizontal and parallel planks of wood lining up a wall and finish it up with a solid, light color, like white, would be transform a home to add in to the rustic look. They also work really well on exposed beams, and drop lighting, even chandeliers. Working with simple furniture and solid colors, and with a significant strong color, complements and completes the look that homeowners likely are looking for.